A warm welcome greets you every time you step out of the shower or bath, thanks to the Ancona Comfort 7 Wall Hardwire towel warmer. Its brushed elegant timeless design and convenient size, allows an easy installation in any room needed, blending perfectly into the space available. As the name implies, this item features 7 racks for accommodation, reaching ideal thermal warmth and coziness in only minutes. The hard wired plate discreetly conceals the wire, creating a flawless fit into your wall. Gorgeous in bathrooms and full of possibilities in the laundry room, exercise room, mudroom or bedroom it's the indispensable item for your home. Your Zen friend Hannah once told you, "Life's pretty simple work hard, save money and keep your pants looking sharp." That's when she revealed how this Foldable Metal Drying Rack helps her achieve all three. It stretches 45-inch high and provides three tiers of drying space for her yoga pants and favourite kimonos. Air drying clothes indoors helps her save on energy costs while keeping all her prints lush and vibrant. And when she's not tapping this collapsible drying rack for life and laundry solutions, she's stowing it away neatly in her closet so they can both keep on living clean. Honey-Can-Do DRY-01234 Commercial Drying Rack, Chrome. This sleek, commercial-grade drying rack boasts heavy-duty construction and a rust-resistant chrome finish. It features angled leg caps for maximum stability. Unlike a wall-mounted unit, this portable rack can be used anywhere including the laundry room, balcony, or bathroom making an attractive drying space out of any room in your home. The space-saving unit offers a full 24-linear feet of drying area and folds down to a mere 3-inches flat for easy storage when not in use. A top shelf provides ample space for drying folded items such as sweaters. Save on energy costs while protecting the environment and increasing the life of your garments. Honey-Can-Do DRY-02118 Folding Tripod Air Drying Rack, Gray/Blue. Maximum air drying in minimal space. This energy saving drying rack holds up to 36 items and uses only 26 square inches of floor space. The extra tall design works for both long and short garments. Unique one-touch folding mechanism lets you fold down both arms and feet in an instant. Constructed with a sturdy and rust-resistant, steel post frame. 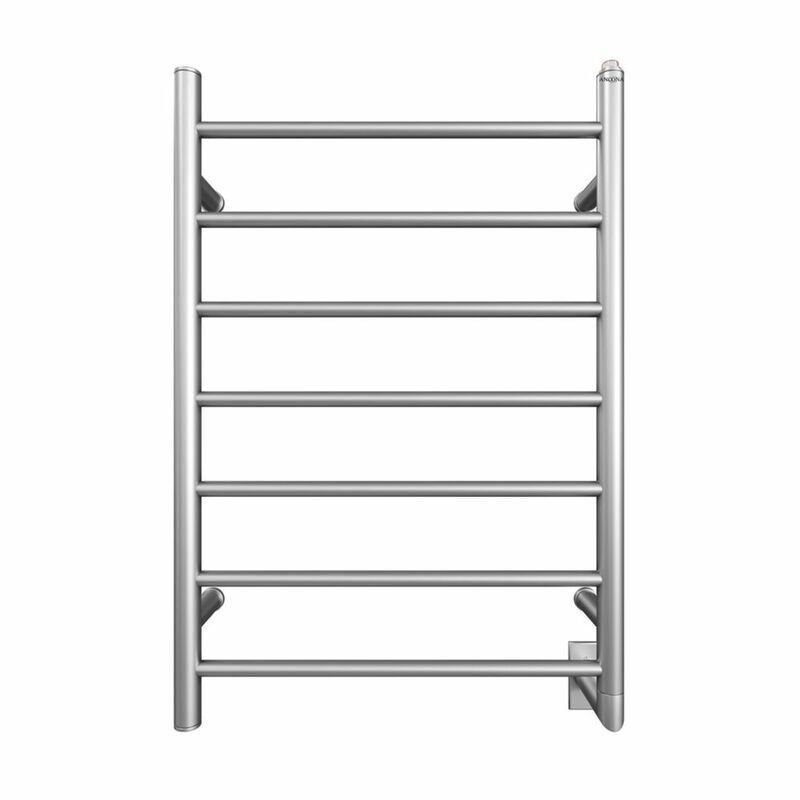 Comfort 7 Wall Hardwire Electric Towel Warmer and Drying Rack in Brushed Stainless Steel A warm welcome greets you every time you step out of the shower or bath, thanks to the Ancona Comfort 7 Wall Hardwire towel warmer. Its brushed elegant timeless design and convenient size, allows an easy installation in any room needed, blending perfectly into the space available. As the name implies, this item features 7 racks for accommodation, reaching ideal thermal warmth and coziness in only minutes. The hard wired plate discreetly conceals the wire, creating a flawless fit into your wall. Gorgeous in bathrooms and full of possibilities in the laundry room, exercise room, mudroom or bedroom it's the indispensable item for your home.